Knit tops are a wardrobe basic; most of us live in them. After awhile, the style can get, well, boring! Welcome to Simple to Chic T-Shirt Remakes, a Sewing With Nancy 2-part TV series—Watch online or on PBS. During this first episode, learn how to transform the common knit shirt into a fresh and smart-looking fashion. Embroidery machine designs are the key to adding embellishment and also the neckline transformation. It’s rather marvelous how it all happens. Joining me is machine embroidery expert Eileen Roche, who uses her embroidery machine to transform off-the-rack tops. Fold the T-shirt in half, matching the shoulder seams. Mark the center front with a pin. Hoop a water-soluble adhesive stabilizer, cloth type in a 5″ x 7″ hoop. Score the paper of the stabilizer within the hooped area with the tip of a pin or seam ripper. Remove the paper covering. Set-up the machine with the embroidery unit. Import the neckline design of your choice. Stitch color 1 directly onto the stabilizer. This is the functional part of the embroidery, a placement guide. Remove the hoop from the machine and place it on the narrow end of the ironing board, top of the hoop at the narrow end. Place the shirt, hem first, over the ironing board and hoop. Align the center marking of the shirt with the vertical stitch line on the hoop. Align the top of the ribbing with the horizontal placement line. Gently smooth the shirt flat over the stabilizer. Nest the shirt above the hoop and transport the hoop to the machine. Use painter’s tape to hold the fabric in place is needed. Stitch color 2, the tack-down; this temporary stitching will be removed when the embroidery is complete. Embroider the decorative elements—the eyelets and the design. Place the 6” x 8” rectangle of prewashed tricot interfacing fusible side up over the embroidery, extending the interfacing 1/2” above the ribbing. Stitch the final color, which is the stitching for the neckline opening—the transformation! Remove hoop from machine and release the garment from the hoop. Trim away the excess water-soluble stabilizer. Slide the shirt over a sleeve board. Cut the shirt between the center stitched lines. Turn the shirt wrong side out and slip it over the sleeve board. Slightly pull the interfacing from the front to the back. Press the interfacing from the wrong side. Insert the tip of a sharp scissors in the center of each eyelet. Gently clip through the fabric. Lacing: Use a yarn needle to thread the lace/cording, and then thread the lace/cording through each eyelet. Three of the Eight Designs to Embroider—Do You Have a Favorite? Our transformed shirts have a surprise, a tasteful repeat of the neckline design at the sleeve hem. Here’s how to add thread accents to your sleeve. Open the side seam of the sleeve and position the center of the sleeve with the center marking stitched on the stabilizer. Stitch color 2, the tack-down stitch. Repeat the process for the left sleeve. Then, remove the tack-down stitching and restitch the side seams. Ta da! Watch Simple to Chic T-Shirt Remakes on Sewing With Nancy online. Step-by-step instructions for T-shirt remakes. 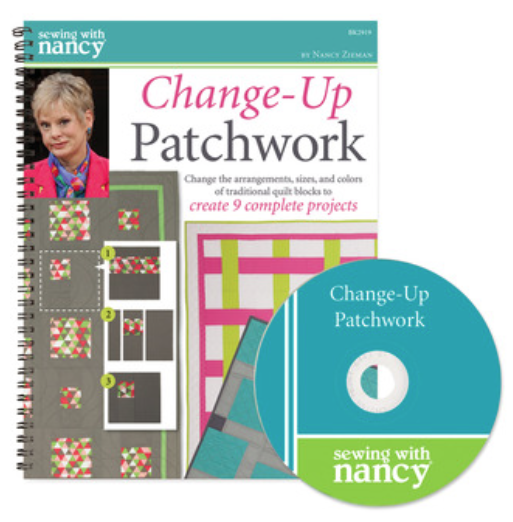 The random winner of a copy of the new book, Change-Up Patchwork, from Nancy’s Notions is Hazel. Her comment was: I love the look of the 7-weave pattern. However, nine patch is my favorite go-to for a project in a rush. Love the variations that are shown. What a great way to get a “new” shirt without spending money to buy one. I would love to try this with my little embroidery machine…. Oh please, I would love to dress up my t-shirts. I have a husband who would love me to have an opening in my t-shirts and this would be the perfect solution. All the designs are beautiful and looks so easy. I have not done any embroidery for awhile. I had seen the identical designs on a full length dress. It had a very ethnic pleasing style and embroidered on batik cotton. Seeing that dress just made me search for that particular embroidery design. I was so lucky to have found it in Simple to Chic T shirts by Nancy and Eileen. How many sweatshirts do you really need? I like snowflakes but confess my favorite is the black. I enjoy the interesting tied neck closure and the thoughtfully designed embroidery! Inspirational! Thanks Nancy! Retirement = t-shirts and shorts! Love them all! I like the black one, also the blue one. I like the one on the red tshirt…but I like anything with red! Great way to add some zing to otherwise boring tshirts! Definitely love the black shirt on the DVD cover. Definitely love the one on the black shirt on the cover. I love all the designs, but I like the hem and sleeve designs the best. I like the one Eileen is wearing. All of them are great. I foresee Christmas presents for this year. I like the one on the front of the package on the black. It look very free spirited and elegant at the same time. I like the simplest lace-up design at the neck and the sleeve design adds something you do not see a lot – could be very chic. Golly, do I have to make a choice? I love them all!!! I can’t wait to go through my closet to see how many long sleeve t-shirts I own…. Super instructions by Eileen and Nancy! My favorite is the one on the shirt Nancy is wearing. I already have my shirt and am ready to proceed. I love the snowflakes! Each design is perfect! It would be a so wonderful to just try the process with the support of the well written and superb photos which accompanies this blog. Thank you all who created the designs and transformed the magic into this blog. I love the snowflake design—-the shirt would look good on any age too—yea….thanks for the chance to win….. I love them ALL!! But if I had to chose a favorite, the blue w/the snowflake looking design. I could do this!! I’ve seen other ways to dress up the neckline of tee’s, but this by far would be the easiest way! LOVELY. What a great use of embroidery machine! I love the snowflakes on the long-sleeved T-shirt and would like instructions on how to embroidery on the sleeve. I love recycling a plain T-shirt! Did you get my comment that I sent yesterday? Just the information I needed. I have tried to remake Tees before, but they came out “just so-so”. Have lots to work on. I am all about the paisley design on the cover of the CD. This will be a welcome addition to my sewing/embroidery library, should I win. Thank you Nancy for all your wonderful inspiration. You are amazing. I like the first (blue) design. I often add embellishments to t-shirts for my mother and myself. I always add a little something to the back of the shirt, too, at the neckline or a motif at one side near the hem. I would love to win this prize. I would love to remake these T shirts! I like the designs placed on sleeves! These are awesome ideas to update plain cotton shirts! My favorite design is on the tan long-sleeved shirt. I love the idea of dressing up a simple t-shirt. I particularly like the brown design on the tan shirt. I get a lot from your newsletters and your PBS shows. Keep up the good work. I love them all! I really like the one Nancy is wearing. Thank you for the video. Oh Wow. I can do this! Totally inspiring. I like the blue, but I have to say I love the black one! It would be a wonderful birthday present! (Tomorrow) Thanks ladies for the great design ideas! Wow I love the whole idea of turning a plain t shirt into a chic t shirt. I am a plus size woman and the availability of attractive clothing is not the same as for smaller women. I love the idea of improving my tshirts so I can look chic like the smaller size women. Thanks Nancy and Eileen!!! I like the black t shirt designs. What lovely designs to dress up an ordinary t-shirt! I love them all, but my favorite is the white design on the short sleeve shirt. Thanks for the fantastic giveaway. They are all so sharp. What a clever way of dressing up a t-shirt. Fantastic and very very sharp! I have the Neckline designs that I purchased a few years back while at a 2 day retreat at B Sew Inn in Tulsa. I use the designs frequently. It is a fantastic way to dress up my t-shirts. These new designs would allow me to add some new t-shirts to my collection. In addition, it is so nice for you all to give us this opportunity. Thank you! I like the black shirt with the white embroidery. I’ve been looking for a set of neckline embroidery patterns for the last couple years that I really liked and now I’ve found it! I’m especially happy to see the sleeve and hem options. My favorite is the white with light blue X’s. Nancy – I’m from Lincoln, NE and yes! you need to come to the Quilt Museum again. I go every now and then and it is always a totally different experience. One wonderful service they offer is their quilt identification days. I took a couple of my oldest family quilts last year. They photographed and documented them for their collection records. And I learned about the fabrics used, the pattern name and they confirmed their 1890 -1900 origins. I am grateful to live near such a wonderful facility. I would have a hard time deciding between the coral T-shirt and the blue short sleeve t-shirt. Since coral is my favorite color, I’ll say that is my favorite. Wow! I have a lot of tshirts in many colors. Keep thinking I will embroider on them but have been afraid of ruining them. This looks so easy. I really like the design with the daisies. The embroidery sure dresses up the t-shirts, the designs are perfect for any age group. I think the black one is lovely, but then I wouldn’t mind any of the others either. Very nice! I like the design on the tan shirt. So simple and elegant. I love wearing t-shirts and now they can be made more grown-up looking. They are all beautiful but I especially like the blue with white stitching. I am a newbie to machine embroidery and loving it! I got a number of DIME embroidery help tools for Christmas. I would love to make these as I wear t-shirts almost everyday, but I especially like the design on the black shirt. Would make that first! I wear only cotton tops so I end up with a lot of plain t-shirts. These designs would enable me to vary my very boring wardrobe. Thanks for the opportunity to enter to win. I like the one that resembles snow flakes. All are great. Be hard to make just one design. All the tops are sooo cute! Would love to be able to make these. Beautiful love all the designs but my favorite is the one on blue shirt reminds me of flowers and snowflakes at the same time. What a terrific way to add new life to those clothing items just chilling in your closet. All the designs are great but my favorite was on the black shirt. I love your blog, lots of fantastic information. Thanks much. I like them all, for a favorite I would say the black one on the package.Would great to win, thanks for the give away. What beautiful t-shirts! Definitely Chic! My favorite is the green design on the dark gray t-shirt, a beautiful way to dress up a “drab gray” t-shirt! I like the gray one with the same design as Nancy’s – exquisite! I love the look of the black shirt. I love the contemporary designs! My favorite is the short sleeved blue shirt. I think they all would be fun projects. Thanks for your continued inspiration an innovative ideas! I believe the black and white one is my favorite. They are all so pretty, it was hard to choose. These are fabulous! I really like the design on the light brown shirt. All of the designs are unique, but I think I like the one with the eyelets would be a favorite. Oh my goodness….each and every one of these designs are beautiful and would look lovely on a t-shirt or sweatshirt! In this post, I really love the design element involved in the black t-shirt. I have not had the opportunity to watch the series yet, but sure look forward to it later on this evening! Thank you so very much for sharing this tutorial. I have an older model embroidery machine and am just learning to use it. Yet, had never considered doing anything of this magnitude…but sure am going to learn how! Also, Thank You so much for this opportunity to win this fantastic prize! I can not imagine the designs on it…bet they are all spectacular! Have a wonderful creative day! Love all of them but my favorite is the one on the red shirt. I like all of them, but my favorite is the first one on the apricot colored shirt. The short sleeve blue shirt ( my favorite color) design really dresses up the shirt! I love the design on the blue short sleeve shirt. I really adds pizazz to the shirt. Also , blue is my favorite color. I like the design on the orange shirt. Thanks for the ideas. These are very cool! And it doesn’t look to terribly hard either. I like them all. I think I would try each one. I’d start with the hexagon shaped design. I love the ties with the beads!! This comes at a good time as I need to clean out my old t-shirts! I like the first design best. Having been a “plain jane” for many years I will start with the simpler designs and move into the more elaborate designs as my comfort level changes. I like all of the designs but my favorite to try would be the one with the eyelets. Wow! So hard to choose! I really like the blue shirt with the “snowflakes” but I also like the shirt Nancy is wearing. What an interesting way to make a one-of-a-kind shirt! Thank you for the chance to win! I love all the designs but I really like the white on black. Sure changes a boring T-shirt – and I do wear a lot of T-shirts. I have a draw full of T’s waiting to be embellished. Can’t wait to get going on this project. Would love to try all the designs, but love the black tee with whit designs..
Love this and so practical to take boring T-shirts which I have so many of, and easily transform them into pretty T-shirts. Especially like the coral one with the smaller, simple stitching, but each design is very attractive and I would enjoy embellishing each of my boring T-shirts with the different options. Thank you for this inspiring video and opportunity to win this CD. They all look great. I love the two black ones the most.. I would even use them on woven tunics that I like to wears in the summer weather. The sleeve and bottom border designs really complete the set. probably use all the designs shown. They’re all wonderful but my favorite is the white on black and I would try it on a sweatshirt because I’m always so cold. I could also see some of the sleeve/hem designs on the outside seam of pants or capris, leaving the seam closed. Can’t wait to try all or these designs! and I really like all the designs shown on the program. I LOVE these new designs!! The floral designs are my favorite. I am currently revamping my wardrobe and these T-shirt redos are the perfect addition!! I would love to have this book. I love all the designs but the black one is my favorite. Thank you. I love the snowflakes on the blue T. Great ideas to dress up some boring tops. I have plenty of those. I like the short sleeve blue tshirt the best, love the design and blue is my favorite color. I love the chic sleeve design on black. So striking! I am somewhat new at embroidery, but would love to give this one (and all) a try. Thanks for being so generous. I think all the designs shown are great. My favorite is the one shown on the blue T shirt. Thanks for the chance to win. I love the t-shirt that Nancy is modeling in the video. It looks great. Actually they all look great. I love the idea of making t-shirts look prettier. I like the black t-shirt with the white embroidery. Very classy! What a great and practical use for my embroidery machine! I love functional and beautiful. Thanks, Nancy, for keeping us in mind! The short sleeve blue is my favorite so far. What a great idea for changing up a T-shirt. I’ve been putting embroidery around the neckline but this adds so much more. I wonder if this would work on sweatshirts as well. I like the most simple design with the least stitches. I love this idea – especially for tee shirts that appear to be more for men than women. Now that I am retired, I live in T-shirts and pants all the time. These patterns would give me a lot of variety. I love the blue one. I like the design in the red T-shirt as it looks like candlewicking embroidery. Wow – love them all and can see making several. I wear t-shirts just about everyday and would love to make them special. I just purchased a new to me embroidery machine and need a special project. I absolutely love anything paisley. These are all great dress it up ideas. Well Nancy and Eileen, you ladies have done it again. I love the long sleeve blue classy t-shirt design. I would love to win so I can make these beautiful tees for others. I like the brown embroidery on the tan t-shirt the best, but I really like them all. A fun way to change-up your plain t-shirt. All the designs are great! I think I especially like the design on the short sleeve blue shirt. Wonderful ways to personalize! This is such a fun design idea to try! Thanks Nancy! I love the blue one, although they all would have a place in my wardrobe. I’ve been ill for a while and my dear husband has been buying me plain t-shirts at a large warehouse retailer when he stops for groceries. This would be a wonderful way to change my wardrobe from plain t-shirts to a variety of beautiful custom shirts. I’m excited about that! I love the black tee shirt on the cover. Great bohemian vibe! I love the long sleeved blue, which I believe is the same pattern as the peach and red… LOVE it!! What a great addition to the earlier Designer Necklines! I really like the black tee shirt on the cover. Great bohemian vibe! The white on black one is my favorite. You and Eileen have a great idea to turn a boring Tshirt into WOW. Thanks for all your videos. I always learn something new from you. Keep up the good work. Love to have this book. Looks like a lot of fun. I like all of them that are pictured, but especially the black one. I like that you can finish off the neckline almost entirely in the hoop. I like the black one shown on the cover, but I might have to add royal blue, turquoise, and Aqua instead of the warmer colors. I love this idea, I LIVE in Tshirts & jeans or leggings. I would love to win! I like the design on the cover, the black with the two designs. I love them all, but especially love the black one on the cover of the booklet. This is one I need to have. I like the design that is on the cover and the design on the gray shirt in green. I’m so grateful that it comes in the format for my machine. Always nice to find something else the embroidery machine can do. I have never been sorry to have purchased one. Thanks for all the inspiration and how to. I like the blue shirt with white stitching that shows all three design locations. What a fantastic idea! I love the black shirt with the white embroidery. I would like to try this. It is such a pretty transformation of a Basic shirt. I like the oatmeal colored shirt. I think I would put a drop of seam seal on the placket front before I turned it for a little insurance. What clever ideas. Love them all. What a great selection to choose from not sure which one I like best maybe # 3 going to order the files so I can make one of each, love the bonus of the matching sleeves. Thanks for all your great sewing and embroidery tips. Can’t wait to make over a t shirt. All right, someone has sneaked into my bedroom and found my drawers of t-shirts! Yes, all are boring. . .plain. I like that blue one on the model! Thanks for having the giveaway! It’s so nice of you to do! I like the one with white stitching on the black shirt best, very classy! What a clever technique! I like the design on the red shirt. What a great way to dress up a plain t-shirt and it looks so easy to do. So hard to decide between the blue and tan design. I have one of Eilene’s designs, Love it! I like the design on the black T, but then I like the blue, I could never pick just one. FABULOUS…. I like the 2nd one of the three (on blue), neat design. But they’re all wonderful, especially the one shown on the cover of the CD. I like the one on the tan shirt probably the best, but I could see using all of them on a shirt! I really like being able to do the seams and the sleeves to match! Wow! What a great way to recycle a plain shirt!! I love the paisley- it adds so much!! I can’t wait to try this with one of my t-shirts! I’ve always wanted to do this, but have been a little afraid to. Thanks for this. I am going to give it a try. I have lots of t-shirts, but they are definitely boring!! Thanks. Wow! This is great. I can see my t-shirt wardrobe getting a make over! I will also be updating shirts for my Daughter and Granddaughter; who just turned 12 and loves this style!